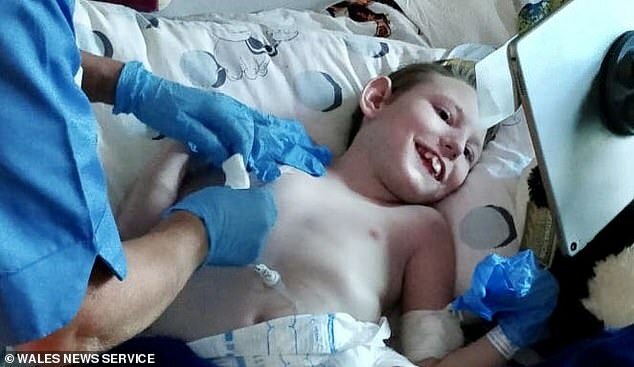 A terminally-ill boy has received thousands of animal videos from well-wishers across the world to keep him happy in his last days. 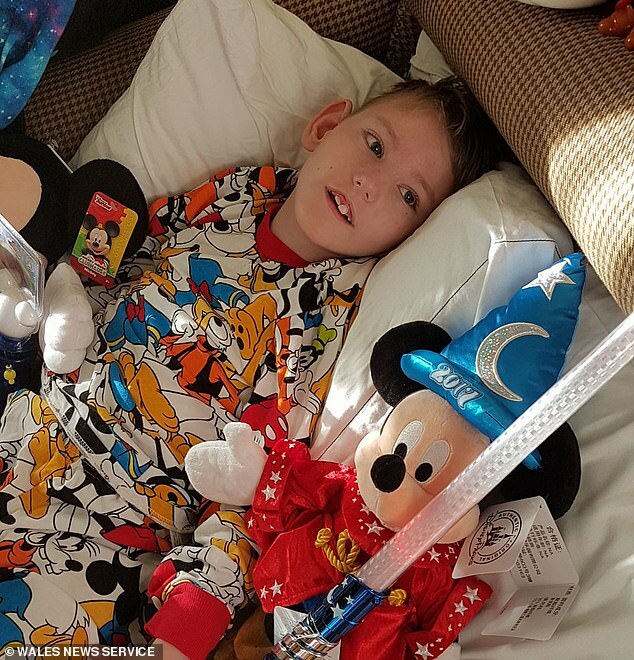 Harvey Hawkins, 11, is receiving end of life care at his home in Merthyr Tydfil, South Wales. He can no longer eat. A Facebook post about him meeting the Wales rugby team mentioned his love of dogs and suddenly the family saw cute videos pouring in. His mother Jamie-Louise Wallace, 29, said they have been sent more than 1,000 clips from as far as Australia, Mexico and even Alaska. She added that if Harvey could speak, ‘he would say thank you from the bottom of his heart’. Harvey was born with series of complex conditions, although it is not clear what these are. In January he was diagnosed with complete gut failure and a condition called intestinal pseudo-obstruction. The rare condition blocks food from moving through the GI tract and may occur due to damage to the muscles or nerves. Doctors dealt the family a devastating blow when they said they had done all they could. 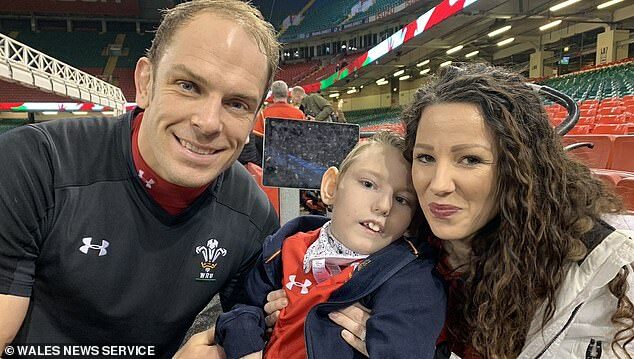 The youngster met the Wales rugby team just before their Six Nations Grand Slam victory on March 15. A post of the meeting went viral after being shared by Harvey’s cousin in Canada, mentioning his love of dogs. Ms Wallace said: ‘We have been overwhelmed with the response and the number of videos. ‘We have had videos of people’s dogs singing or saying “hello”. We had one dog saying “I love you”, and another dog playing the piano. ‘It’s not just dogs. There are videos of turtles, cats, chickens, horses, snakes and fish. Messages have come in from Alaska, Australia, and Mexico. 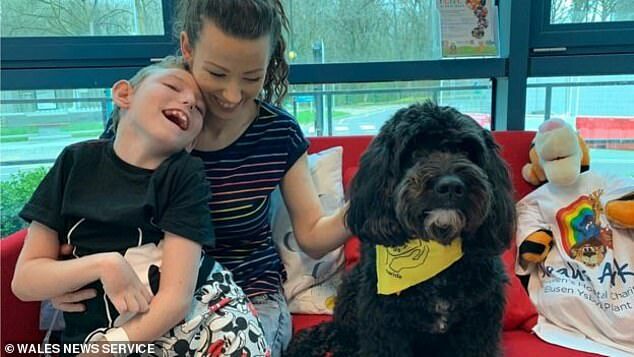 Harvey is being cared for at Noah’s Ark Children’s Hospital for Wales in Cardiff, where he was recently visited by a therapy dog called Nico. Ms Wallace said: ‘All of Harvey’s discomfort and agitation seemed to melt away when he stroked Nico, something which is only usually eased with medication. ‘If Harvey could talk, he would thank everyone from the bottom of his heart. Bethan Simmonds, from Noah’s Ark charity, said: ‘As much as we all want to, it isn’t always possible to make everyone better. WHAT IS CHRONIC INTESTINAL PSEUDO-OBSTRUCTION? Chronic intestinal pseudo-obstruction (CIP) is a rare disease that occurs due to abnormalities in the involuntary muscular contractions of the gastrointestinal tract. This blocks food from moving through the GI tract and may occur due to damage to the muscles or nerves. Symptoms vary from person-to-person depending on the location and extent of the disease. Nutritional supplements may be required to prevent weight loss and malnourishment. CIP can be genetic or occur seemingly at random. Diseases such as lupus, rheumatoid arthritis and diabetes have also been linked to CIP, as have the infections Chagas disease and Epstein Bar virus. CIP that is present at birth has been associated with a foetus being exposed to certain toxins. The condition may also be brought on by certain medications, such as some classes of antidepressants. CIP’s prevalence is unclear. According to some sources, 100 new cases occur every year in the US. The number of sufferers in the UK is unknown. There is no specific treatment for CIP. In mild cases, patients should eat five-to-six small meals a day that are low in fat and fibre. Medication can help to speed up the rate food moves through the GI tract and eases symptoms. Patients who are unable to eat due to the severity of their CIP, may require feeding through a tube directly into the GI tract. Surgery to remove part of the intestines may also be necessary, however, this can make CIP worse.